In a season filled with intrigue, passion and intense drama, Opera Theatre St. Louis‘ Orfeo & Euridice is a refreshing dose of mystic escapism. Composed by Christoph Willibald Gluck, this new English translation, commissioned by Opera Theatre St. Louis, is based on the adaptation created by Hector Berlioz which lifted elements from the opera’s Italian and French versions and fused them into a more compact production whose themes of overcoming suffering, loss, and pain in the name of love still remains relevant. It also has a substantially less morose ending than Gluck’s original, offering viewers a nice respite in these turbulent times. Superbly executed on several fronts, Orfeo & Euridice dispenses with cumbersome intricacies in favor of a more straightforward story rounded out with a general seasoning of ballet and a gorgeous orchestration swaddled in horns and strings to greatly enhance the mood of the production. Based on the Myth of Orpheus, the opera literally goes underground in act one as a grieving Orfeo seeks permission from wild furies to enter the Underworld to rescues his deceased bride Euridice. Impressed by the depths of his sorrow he is granted permission. But there’s a catch, Orfeo cannot gaze upon the face of his beloved until both have returned safely to the living world. He also cannot tell her why he is not gazing upon her. Not an easy thing to do when you are reunited with your wife. 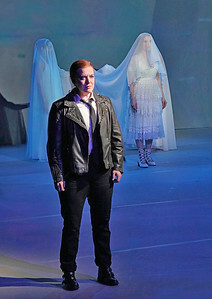 As the second act unfolds, Orfeo’s agonizing journey to Hell and back gets a brief reprieve in the Elysian Fields where his torment is eased by a reunion with his wife. His happiness is short lived however as events unfold that test the power of the couple’s love. Relying on an open stage and colorful projections to establish atmosphere the production is a contrast in technical styles with a drably colored first act overwhelmed by the Technicolor for the second, enabling the audience to aesthetically accompany Orfeo on the dangerous journey. The visual and dramatic achievements of Orfeo & Euridice rest squarely on the brilliant output from its three principles, each of whom sings their guts out at every turn. Loaded with captivating performances Orfeo & Euridice is a glorious feast of high drama. Jennifer Johnson Cano singlehandedly commands the first act in a breakout performance. Andriana Churchman shimmers as Euridice giving the role the perfect blend of pathos and stunning beauty. Her scenes with Cano are riveting. Maria Valdes gives the spunky Amore some depth and texture, taking a somewhat whimsical character into deeper terrain. Director Ron Daniels’ fresh take on Orfeo & Euridice features an amazing chorus who perfectly frame the spectacle onstage. 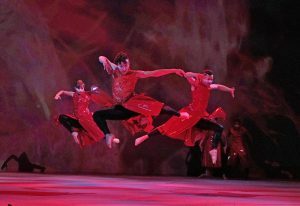 His perfectly pitched production also features a collaboration with the Big Muddy Dance Company whose participation brightens up a simple, uncluttered set with a barrage of fluid and kinetic movements. Their inclusion adds a punchy vitality to the production. Triumphant and bold on all fronts, Orfeo & Euridice begins slowly with a procession of candleholders entering the stage for the audience and ends with an intense finale that underscores the power of unconditional love. Orfeo & Euridice is sung in English with musical accompaniment from The St. Louis Symphony Orchestra. Performances are held at the Loretto-Hilton Center on the campus of Webster University. For more information visit opera-stl.org.